Usually after the first full application , then you can expect to get 2 applications from the one tube . That is applying to the roots only each month or when necessary. Apply to roots only each month. This eliminates too much gold colour building up and gives a lovely ashen gold effect on your grey hairs . 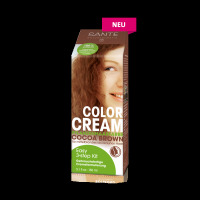 example :on light brown hair with 40% grey hair the result will be light brown hair with 40% highlights .